Away from home or on the road with no access to a gym? 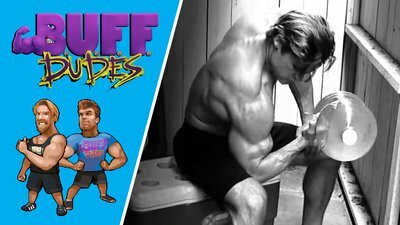 The Buff Dudes can help you create your own little disposable gym with just a few everyday items. Gains are only a few gallons away! Necessity is the mother of invention, right? But what does that mean? Processing it through our highly sophisticated Buff Dudes interpretation machine (an old computer running Windows 2000), it means that the primary driving force for most new inventions is a need. So, what was the need that drove us to this invention? Easy: We needed to come up with a way to do our gym exercises when we were on the road and away from home. Quick! Let's flash back to the year 2009. It was a different era, a simpler time. We had yet to colonize Mars. The first flying car had yet to be seen in the sky above. And the Buff Dudes were stationed in a small remote town hanging sheetrock. We had the boulder shoulders covered, seeing as we were overhead-pressing sheets of drywall all day. But something else was missing: a gym that would help us work other muscle groups besides our shoulders! With no gym in sight and no access to barbells or dumbbells, we improvised. Instead of dumbbells, we decided to try water jugs. Unfortunately, your average gallon of water weighs a little under 8.5 pounds. Doesn't sound like enough to build a Buff Dudes physique, does it? That's where the next item came into play: an old belt. We quickly learned that in addition to holding up your pants, belts are an excellent way to strap together multiple water jugs. Suddenly, 8.5 pounds became 40 pounds, and we were curling, chest flying, and bent-over rowing our way to success thanks to our friend Mister H20. The water-jug setup also made for excellent hydration throughout the duration of the workout, although it did make the weights lighter as time went by. Perfect for the burnout set! So, we now had most of the standing exercises covered: curls, overhead press, squats (you'll be loading up a lot of water jugs on that one). But what about exercises that required a bench? Did a lack-of-viable-options monkey wrench just get thrown into our Water Jug Workout gears? Heck, no. A staple of most camp and construction sites, the camp cooler makes an excellent alternative to the traditional gym bench. For just a few bucks, we opened up a whole new world of exercise options for bench presses, seated Arnold presses, flyes, and more! With water jugs, old belts, and a camp cooler now at our disposal, our DIY-gym kit was almost complete. The only thing missing now was a killer workout-music playlist, an omission that was quickly rectified. We won't give out any playlist advice, but if one day you happen to stumble across Yngwie Malmsteen's "I Am a Viking" on the way to your next workout, trust us; you won't regret adding it to your list. So here's to necessity and invention. We were away from home on a construction site, facing two months of potential boredom and lack of gym access. But once we put together our DIY-gym kit, we quickly filled our time with killer water-jug workouts. No doubt our setup looked a little quirky to some. But the only thing that mattered to us was this: It worked. The next time you find yourself away from home, unable to access the gym—or just up for something new—try the Buff Dudes' Water-Jug Workout, where gains are only a few gallons away.